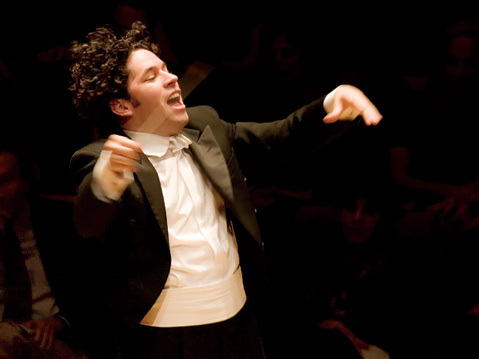 Gustavo Dudamel led the Los Angeles Philharmonic in works by Ravel, Vivier, and Tchaikovsky on Sunday at the Granada. When the original guest soloist, Yefim Bronfman, was sidelined with a broken finger approximately a week before this concert, Maurice Ravel’s marvelous Daphnis et Chloé replaced the scheduled piano concerto by Béla Bartók. Subscribers to the CAMA International Series will remember an especially ravishing version of Daphnis et Chloé offered by the Orchestre Philharmonique de Radio France at the Granada in March 2010, surely one of the highlights of that season. This performance was exceptional in its own way. While perhaps not as deliciously airy and effervescent as the exquisite winds of the Radio France orchestra, the Los Angeles Philharmonic’s tone was nevertheless intriguing, emphasizing instead the dissonance and graininess of the work, thus putting it more in the context of Stravinsky and Bartók than of Debussy and Fauré. The piece was preceded by an odd but memorable short fanfare of sorts called “Orion” by Claude Vivier. The second half of the concert was given over to Tchaikovsky’s Symphony No. 5. This is the kind of thing that Conductor and Music Director Gustavo Dudamel and the L.A. Phil do incredibly well, and it was easy to see and hear what all the fuss is about. Walls of heavenly sound peeled off one another in tremendous, dark, and stabbing lines of mid-range strings until horns, winds, and tympani gathered to rumble and explode. Tchaikovsky was reportedly ambivalent about this work, but to 21st-century listeners, it has to be one of the greatest symphonies in the repertoire.